Your cards are just precious and will be greatly appreciated I'm sure! Great tutorial on your glue dots! You go girl! Such pretty cards, Seongsook - I especially love the purple one, with two rounded corners. Very unique! And the gluedot tutorial is great, thank you! Thanks for sharing your beautiful cards, hope you enjoy the hop today! Ohhh myyy, I soooo want to try to make my own glue dots, that is such an awesome idea. Love it! Love the turtle tea party stamp. That is adorable! I love your cards. I noticed on the first one you corner rounded only two corners. I like the look and will be using it in the future. Thank you also for you glue dot tip! What a great way to use your tack it over and over. That glue dot tip is Brilliant! Also I love the coloring/chalking you did on your cards. I wish I was better at that. Hi I loved the idea about making your own glue dots...also your image was done beautifully...thank you so much for sharing your expertise! What great cards. I love the flowers and you did a great job with that Karen's Doodle. Thanks for the sticky dot tut. I also make cards for heroes because I am so thankful for their serving our country and people. Thanks so much for the tutorials and the hints. Your cards are just amazing! Very cute cards. You need to post a tutorial on how you colored your second image. Beautiful! Your cards are great TFS, also love the tip on the "glue dots"
Your cards are so sweet and thanks for the gluedot trick! Great cards and thanks so much for the tip on the homemade glue dots. I will most definitely have to give those a try, buying them gets so darned expensive. Many thanks! Both of your cards are beautiful! Thank you for showing us how to make our own glue dots, very clever! Thank you for the tutorial, I use glue dots all the time this is great. Also thank you for the great work you do for OWH. Great job with the cards and awesome money saving tip! Adorable cards and such a useful tip about the glue dots. How cute is that digital stamp with the tortoise? Wow! Adorable! I love your cards and the tutorial will definitly come in handy. I have really enjoyed your site as well. Thanks for sharing the glue dot tips. Great cards! Beautiful cards Seongsook! I love the tea party one...it's adorable! Thank you for the glue dot tutorial! I need to give this a try! Great cards. The images are so sweet. Thanks for the tutorial of the glue dots. love your card... and such a great tutorial.. way to go! OMG! I LOVE the tip! Thanks! I've never thought of doing something like that! And you have beautiful cards! Also, as a military wife I want to say thank you for using your creativity to help OWH bring families closer together - no matter the distance apart. Cute cards and what a great idea to make your own glue dots! Thank you! I really like both of your cards. And the glue dots - I will give it a try tonight. The turtle card is just too cute. Seongsook, you've made two more beautiful cards! I like the way you rounded the 2 corners on the firs one. Thank you for making cards for our heroes! You have a beautiful talent! Love the cards! They are really CUTE!! Pretty card! and thanks for the glue dots tip too! How pretty, that 2nd image is too cute!! Your cards are so pretty! I love the delicate lace on the first one especially. And such a great tutorial. I just happen to have Tack it over and over as well as an empty Avery sheet. Thank you so much for this money saving tutorial! Your cards are gorgeous!!! I especially like the one with the turtle. :) Thanks for the glue dot info. And thank you very much for supporting our troops!!! Seongsook, LOVE both your cards! Love how you rounded the corners on the first card and fun image on the second! Great idea to corner round the 2 opposite corners. Love that look. Thanks also for the glue do tutorial! I'm blown away by how you make your own glue dots! Something I never would have thought of in a million years!! TFS!! Your cards are so cute, and perfectly colored too! Nice job! Thanks for the tip! We have a big project coming up at my son's school and this will save us lots of money by making our own glue dots!! What a clever idea for homemade glue dots! I love it! What lovely cards! They are both so beautiful. Great card and thanks for the great tip. Pretty cards! The turtle image is so cute! I love your homemade glue dot tutorial too. Thanks for sharing! cute flower basket and great tutorial! Seongsook great tutorial for the glue dots. Your cards are really nice. Have fun today!!! Those cards are going to be a big hit, I'm sure! Thanks for the idea for glue dots, that's a GREAT idea! Thanks for your tutorial on the glue dots! Great thing to know! I love your cards.. they are so refreshing and make me smile! Thanks for hopping with us today! Love the glue dot tutorial!! Thanks. Seongsook your cards are absolutely beautiful!!! Love the coloring in both cards!!! Thanks for sharing the tutorial on the glue dots! I've always heard about it but never had a visual, so thank you!! We miss you over at Sew Many Challenges by the way!! But I see you've been busy with a great cause!! 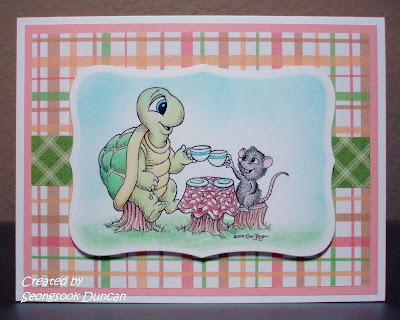 love the turtle and mouse card... your coloring is wonderful! Beautiful cards! Thanks for the glue dot tip! I like both card, but I love the image you used for the second card. Neat idea to make your own glue dots. I bet that saves a ton. Both cards are lovely - thank you for sharing! I love your coloring on the 2nd card, especially. Thank you so much for the glue dots tutorial, as well - always looking for a way to save a couple $$ ... Thank you for participating! Fun cards! And homemade glue dots? Who knew!?! Thanks for sharing! Love the purple flowers! I have never tried the Bic It markers but I would like to. The second card is just adorable! Thanks so much for the tutorial!! I love the colors in both cards. The pot of violets popped with those pearl centers. The tea party made me think of sweet little girls playing dress up. Thanks for the tip on the glue dots. I've got the Tack It over and over, just trying to find time to try it. I may have to wait a week for drying in my humidity. Thanks for taking part in the blog hop and supporting a great cause. Love your cards. And thanks for the tip on using the label sheets...doh! I have been saving the backing of stickers and everything else, but this makes so much more sense, and I just threw one out, time to dig it out. Thanks for your hard work sending cards to our heroes. Awesome cards & thanks for the glue dots trick. I'm definitely going to try that! LOVE YOUR CARDS! Thanks for sharing and supporting OWH. I appreciate you stopping by my blog during the hop and leaving your kind words. Good luck in my OWH giveaway! I love both of your wonderful creations!!! all the lovely details are positively perfect!!! Thank you for the glue dots tutorial!!! I am going to have to give it a try! Your cards are just so cheery and sweet. I love the colors and the subject matter too. Great job! Thank you for contributing to OWH. Great cards! Thank you for the tips on glue dots. Loved how you rounded the 2 opposite corners... clever! Love the paper on the turtle card.... and THANK YOU for the tip on homemade glue dots. I am definitely going to try this one! Thanks for the info on making glue dots! Both your cards are great. I love the lace on the first one and the image and colors on the second! Both of your cards are gorgeous & thank you so much on the info to make glue dots!!! I'm so excited to learn about OWH & can't wait to get started! Great cards! Love the glue dot idea... THANKS! Beautiful cards! Thank you for the glue dots tip! What a great idea for the glue dots. Thanks for your work with OWH. Thank you for the tutorial on making glue dots. Your blog is always one of my faves Seongsook! I couldn't wait to get here! That flower card is amazing - I just love the shape of it and the glue dot tutorial is just over the top! I am going to have to try that tip! You are the best!! !